Some users are reporting a network issue on their iOS powered iPads and iPhones. This bug seemingly grays the Wi-Fi toggle in the Settings preventing users to connect with the Internet via Wi-Fi. It also leads some to WiFi Not Available error message. Here are a few fixes to help you solve this error of WiFi Not Available on iOS devices along with the grayed WiFi toggle. Restarting almost always works as it fixes many a problems that we face in our devices. Just press and hold the Sleep and Home keys for a few seconds until the screen goes dark and Apple logo appears. 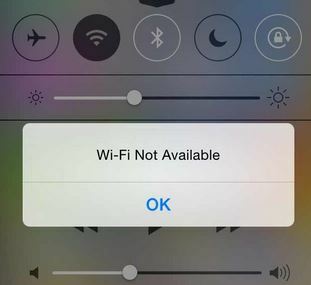 It is the easiest and quickest tip to fix WiFi Not Available on iOS devices along with other minor software issues. While some users actually start facing the WiFi Not Available on iOS devices after they upgrade their devices to the latest OS, it works in other cases. If you have started facing it without the upgrade, try to update your iPhone or iPad to the latest iOS offering to be sure that any network or connectivity issue is fixed. To fix connectivity issues, you must try to reset Network Settings as it fixes some minor bugs that we face with networks and communications. Resetting Network will clear all of your data related to Networks, i.e. Wi-Fi passwords, VPN settings, and the sort but you can always configure these small bits again. Now tap on Reset Network Settings which will ask you the passcode if your device is secured with one. Enter it. You will now be shown a popup informing you about the deletion of all your network settings. Tap on Reset Network Settings to confirm. Your iOS device will now reboot. Hope that resetting your Network settings solves the grayed out WiFi toggle issue on iPhone and iPad. However, if it unfortunately does not, there is one last resort left to fix WiFi Not Available error message and the grayed out Wi-Fi toggle in the settings. 4- Restore your iPhone / iPad! To restore your iOS device, connect your iPhone or iPad with computer and do so via iTunes under the Summary tab. Make sure to keep a back up of your device before you restore. If none of these sort out the network troubles on your device, I am sad to be the bearer of bad news but, it’s time to visit that Apple store for repair or replacement.